Yesterday afternoon I went with two year 6 children (Tafani and Terrence) to Harris Crystal Palace school to take part in a circuit training and assessment afternoon. 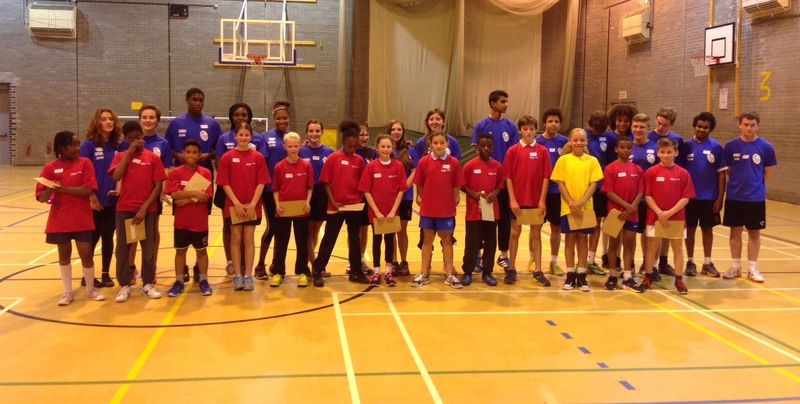 This was part of the gifted and talented programme run by Croydon Schools Sports Partnership. Both children had fun doing the various tests and exercises alongside pupils from other croydon schools. Tafani and Terrence impressed me all the more though when two of our trains back to school were cancelled and, without a word of complaint, they happily walked back most of the way. Once again, Heavers Farm pupils representing our school wonderfully. Here is a picture showing the year six children (in the fancy red t shirts they were given) and their secondary school trainers (in blue). Next Post Thought for the Week: Why do we need to keep safe on Bonfire Night? That was fun, don’t worry Caleb you would of been exhausted.